Maha! I was reading ur trending tweets during the show. And this is a good recap of the crap that went on tonight. Kanye is ridic! What a big ol' jerk! Does NO ONE have any class anymore? 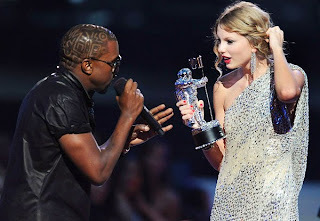 He must have felt like a D-Bag for ruining Taylor Swift's moment when Beyonce got her time to shine with Video of the Year. At least I hope he did. I think Kanye is getting it from every angle. He isn't living this screw up down anytime soon.